I have not done a cooking with kids post recently. The kids have been helping a lot in the kitchen, but I have not done a lot of specific recipes with them. My 11 year old daughter however did make dinner for us recently. 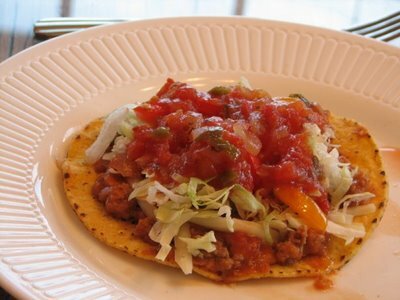 She made us tostadas. It was a great recipe for her to make for dinner because it is a crockpot meal. 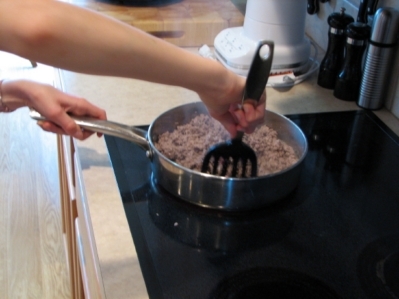 The only thing she had to cook was the ground beef. I think easy recipes like this are the best recipes to use when kids are starting to cook full meals. If you have them make something complicated or with a lot of ingredients it will be overwhelming for them. If you start with a simple and easy meal, they can make it quickly and they won’t get discouraged with the job. And in the end they will have great feeling of accomplishment knowing they made the whole meal.